Following the recent controversy over the development of the vacant land on Esperanza Boulevard, an anonymous benefactor from a neighboring HOA has purchased the property to remove it from the reach of a commercial developer. Esperanza Estates is working with the two neighboring subdivisions to jointly raise $150,000 to purchase the land from the new owners. You will soon be receiving a letter from the EE HOA Board of Directors that will enable you to make a pledge. Pledges should be returned by March 19. Click here to read the full announcement from the EE Board. The movie on Wednesday, March 14, at 7:00 PM in the Ramada will be Dunkirk, a World War II thriller about the evacuation of Allied troops from the French city of Dunkirk before Nazi forces can take hold. Thanks to Jane & Eric Ellingson for sponsoring this event. (Reminder: the Ramada is equipped with an inductive hearing loop to assist anyone with a 'T-coil' equipped hearing aid or a portable loop receiver to hear the dialog clearly. If you'd like to get a receiver for $10, email to ee-webmaster@msn.com. The Enhancement Team did it again and broke past years' sales records! The proceeds will help enhance our wonderful neighborhood. Thanks to the Enhancement Team and all the extra volunteers who worked to make this sale a success and a lot of fun. Thanks also to those of you who donated goods and shopped. The Hospitality Committee will be hosting a potluck dinner on St. Patrick's Day, Saturday, March 17th at the Ramada. Please bring a dish representing your own heritage or a regional dish that you love. There will be no cost for this event. Beverages and dessert will be provided. Happy Hour will begin at 4:30 PM, and dinner will be served at 5:00 PM. We are encouraging St. Patrick's Day attire or accessories! Karen O'Brien will lead the discussion of Inside the O'Briens by Lisa Genova on Tuesday, March 6, at 11:00 AM in the Ramada. 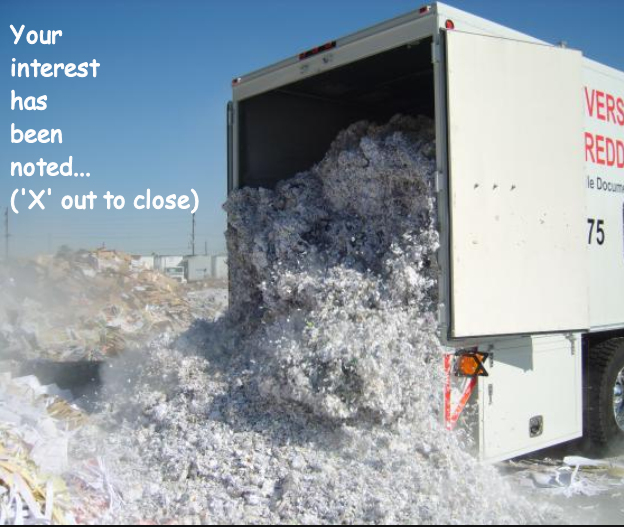 Beacon Secure will be collecting documents to be shredded off-site. The team will hold the event only if enough residents are interested. To let them know your interest in participating, click here. If you have already responded, you don't need to respond again.